Royal Vegas is part of the Prima Poker Network (Microgaming), a large poker community comprised of a number of sites that run the same software platform and share players at the tables. Because players are shared across the network, there are many players online at all times. 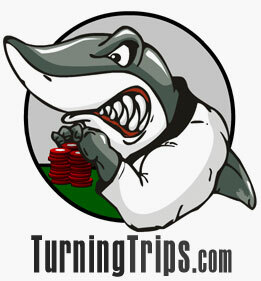 If you are looking for a great looking poker site, you'll want to look elsewhere. Like all Prima Rooms, Royal Vegas's visual design is sub-par at the best. It does the job, but that's about it. Graphics are a little dark and lack much character, sounds are minimal and aren't much better. If you can get past the aesthetics the there's nothing wrong with the game play, and there's a respectable number of players spread around the games they offer. Ring games and tournaments are both fairly active across the board, but Hi-Lo games are not offered. (Prima is one of the few places to offer five-card stud games however). While most aspects of different poker rooms in the Prima network are the same, two things that are different from room-to-room are bonuses offered and special tournaments. Sign-up and ongoing bonuses are plentiful at Royal Vegas, and it offers more special events than anyone else on the network; special tournaments are frequent, with a lot of specials for college players as well. 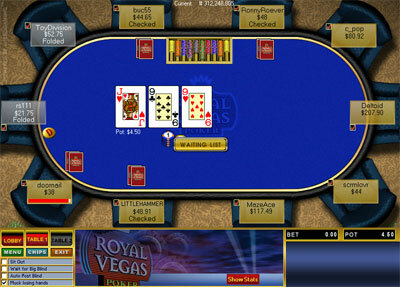 Royal Vegas offers a 100% 'All-In' bonus for new players (up to $100 maximum).